Give it time to index. It will start right after the installation of KDE SC 4.13 and it took quite some time (about 2-3 hours for me, and I restarted the computer and killed the processes once, because it seemed to hang), but when it is finished you will not notice it anymore. If you experience problems, now is the time for bug reports! I filed a bug about a crash when changing ratings while the file is indexed, and 2 weeks later it was solved. Due to the fact that my previous manual is already getting a bit old (it was for KDE 4.7 and KDE 4.8), I decided to write an update about my experiences with Nepomuk in KDE 4.11. This article is meant as an addition to the other manual, but I try to point out the differences and provide references in order to use it as a manual to set up Nepomuk in KDE4.11 without having done it before. The find button opens a search bar, which behaves differently depending on if you open it form an indexed or from a non-indexed folder. In non-indexed folders the options are deactivated and the search is a simple GNU find or GNU grep search. The first start of Dolphin offers not too many surprises. The “Add Tags”, “Add Comments” and Rating fields are present in the sidebar (press F11if you can’t see it, or, if you can see the side panel but not the information, right-click in the side panel and choose “configure”to enable the information). That means, Nepomuk is already active.You can verify (or enable) it by starting the Desktop Search application (just search for “Desktop Search” in the Start Menu, or choose it in the system settings)and see if “Enable Nepomuk semantic desktop” is active. I could not find the system tray icon anymore (but the new indexer is fast and silent, it happens much less often that it has to be suspended). The biggest difference is the way to perform a search in Dolphin. 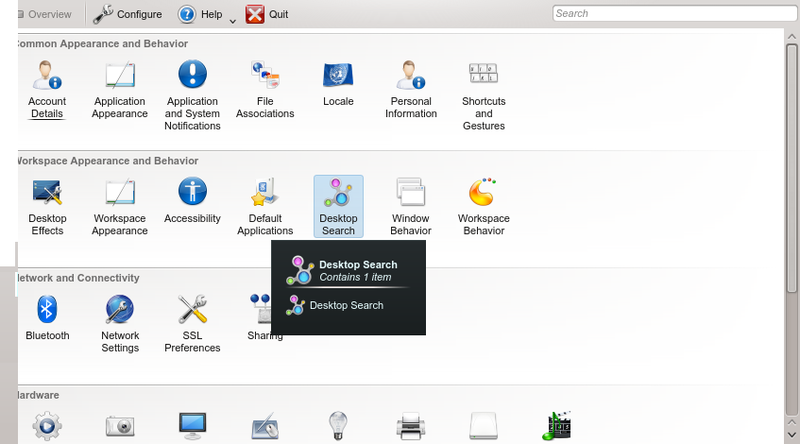 Before (Chapter 3 of the documentation for KDE 4.7), there were a “Search” and a “Find”button in Dolphin that opened the search bar and the search panel respectively. These buttons were merged into the “Find” button(the “Search” button does not exist anymore). If you don’t see the find button, right-click on the toolbar and use “configure toolbar” to add “Find” to the the current actions. 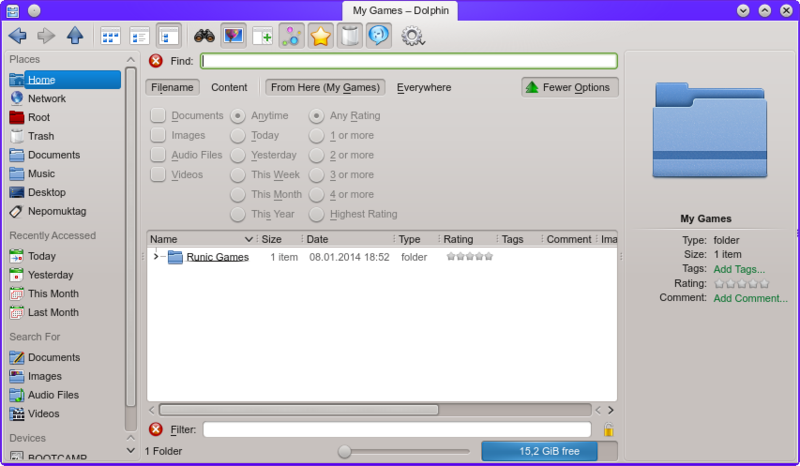 The following picture shows the find menu in Dolphin when the find button (Strg+F) is pressed. As you can see, all the options are grayed out. See Chapter 1.3 for more information about that. Just opening the find menu in Dolphin (Find-button or Strg+F) and entering a search word performs a simple filename or content search, but only if indexing is disabled or the folder is not among the indexed folders (see Chapter 1.3 for information on indexing). It doesn’t matter if other folders are indexed or tags/comments exist in other folders,even if the everywhere-option is activated. You can see if a folder is not indexed if the other search options (document type,rating,…) are deactivated. In this case, tags, comments and ratings are neglected, and every folder is scanned (even those which are not indexed). 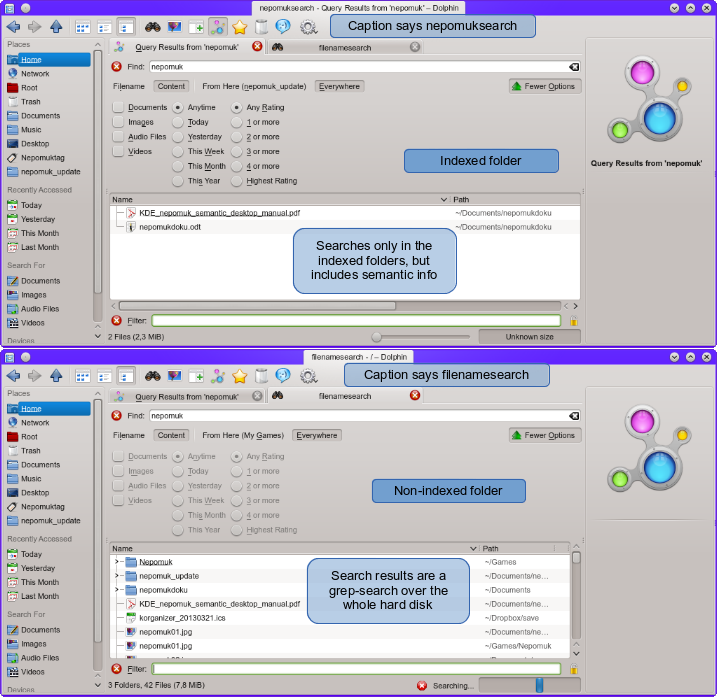 The following picture compares the two search modes. In both cases, content search is enabled (necessary to search in comments and tags). Unfortunately, this strategy is a bit confusing, because the results depend on the folder from which the search is started, even if the search is performed over the whole system (“everywhere”). It would be more comfortable to have a check-box in the search tool to turn the indexed search on and off (like Kfind offers). More info about how to index folders can be found in Chapter 1.3. If you have already tagged some files, you might notice that that tags for the file types(Documents, Images, Audio Files, Videos) are present, but no user-generated tags are visible (as they were as seen in Chapter 3.1in the KDE 4.7 Manual). Honestly, I haven’t found a comfortable GUI-way to choose from the available tags of the system in Dolphin. in the address bar of Dolphin (or Konqueror) lists all tags and allows browsing in them,but it is not as comfortable as the check-boxes of KDE 4.7/4.8, and it doesn’t allow combining it with the advanced search (like rating and keyword search). Creating a new file does not really make sense, apparently KDE doesn’t know where to save it and tags the template file instead. 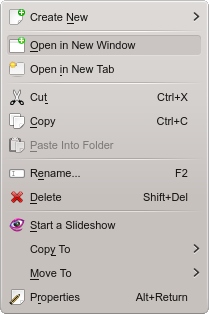 But “Add to places” creates a virtual folder for this tag (see Chapter 3.1 of KDE 4.7 for virtual folders). “Start a slideshow” opens Gwenview and starts a slideshow with all files of this tag. The “copy” and “move” operations copies or moves all the tagged files to the given place (copying removes the semantic information of the destination file). You can rename the tag, and all the tagged files automatically get the new name as a tag instead (but the bookmark in places gets not updated. so if you rename a tag, delete the old bookmark and add it again). All files with both tags are listed. Anybody who knows how to do an OR-search, to get files with either tag1 or tag2? Another way to search for tags is to clicking on a tagged file and then clicking on a tag in the side panel. All the files having this tag will be listed. In order to search for a tag using the Find-menu in Dolphin, the folder has to be indexed (see Chapter 1.3). 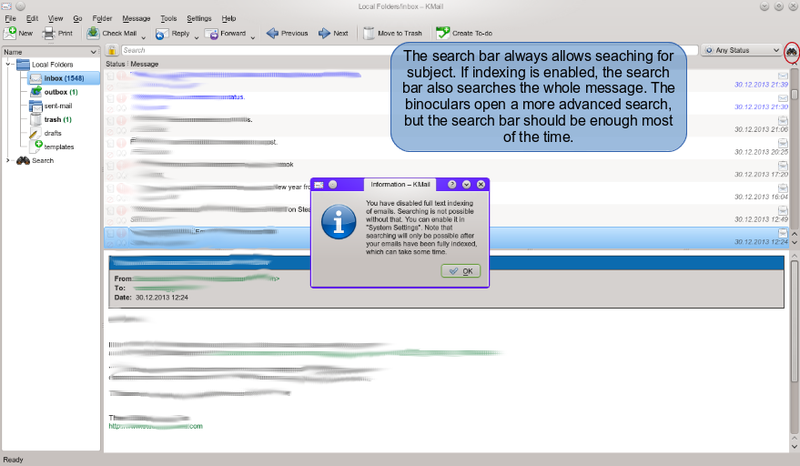 Advanced search is performed via the Find-Button (Strg+F) in Dolphin. The reason for this: The search can only be started from folders that are checked in the Desktop Search Configuration as indexed folders. To activate it, go into the desktop search configuration (“Desktop Search” in the start menu or in system settings) and check “Enable Nepomuk file indexer”. Then click on the “Indexing” tab. With “Customize Folders” you can choose which folders should be searchable (see Chapter 1 for the configuration of Nepomuk). Entering a keyword into the search bar of an indexed folder performs a search within the index of this folder. To include semantic information (tags, comments) in the search, make sure “content” is enabled. Otherwise, only the filenames are searched. The search within the index is explained in Chapter 1.1. To include tags, ratings and comments in the view modes of Dolphin, you can configure the view modes by clicking on the Dolphin option menu and choosing “Adjust view properties”, choosing a view mode and clicking on “Additional information”. You can check tags, ratings and comments. In the detailed view, you can even right-click in the title bar (Name, Size,Date,…) and check the desired fields. 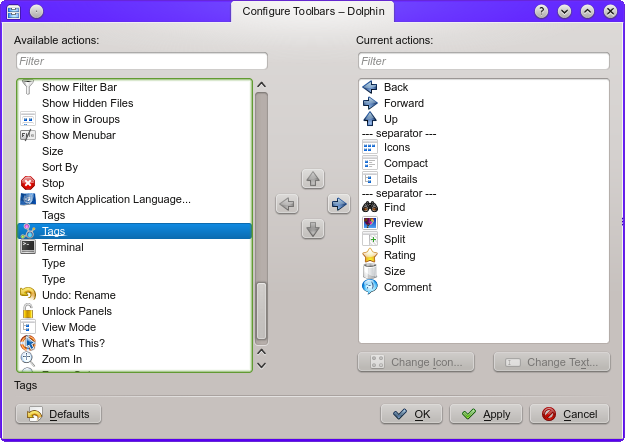 In order to be able to turn the view on and off on the fly, right-click in the Dolphin toolbar and choose “Configure toolbars”. You can add Tags, Ratings and Comments to the current actions, and they appear in the toolbar. But beware, at least in my system every entry appears 2 times in the available actions, but only one of them works, you have to try out which one it is. I assigned the icons myself. Originally, neither of these options had an own icon. If you think your Nepomuk database is already messed up (for example, files sometimes appear several times in the search results, when the tag database and the index both return a hit) or you are not satisfied with the results, you can try to clean up the database. 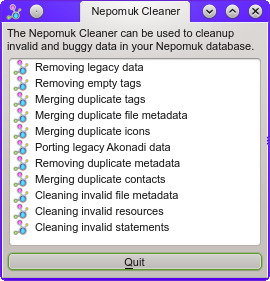 The Nepomuk developers offer a comfortable cleanup tool called Nepomuk Cleaner. You can easily start it by searching “nepomuk” in the start menu or going to All Applications -> Utilities -> Archiving”. You can limit Krunner to Nepomuk, which makes the search results more specific (though the search is not full-text), by assigning a global shortcut to it. If you are lucky, Krunner gives a tag as a result, which allows to do a full tag-search with one click. Unfortunately, I have no idea how this tool should work. Can anybody explain it to me? I don’t get any results. The desktop search configuration also offers to index E-Mails in KMail, so I gave it a try and clicked the checkbox “Enable Email Indexer” in the Nepomuk configuration (see Chapter 1 for the configuration). Set up your accounts when you have a stable and fast internet connection (i.e. at home and not in the train). Wait until really all folders are synced. Do not interrupt the syncing. Best is leaving it over night if you have a big mailbox. Configure the sent-mail (settings – identities – advanced) and trash folders (settings – accounts – receiving – advanced for IMAP) correctly (so that one account do not use the folders of the other account). When everything is synced, choose disconnected mode and automatically compact folders (settings – accounts – receiving – advanced) for IMAP. Close KMail before you start the first indexing, and leave it alone until it is finished (best over night too). 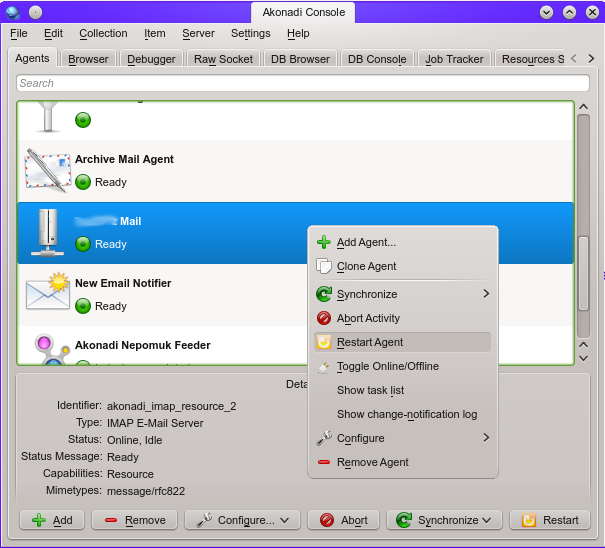 If it happens that your IMAP account is constantly offline, restart the agent for your IMAP mailbox in Akonadi. Open the akonadiconsole (command “akonadiconsole” in a terminal), look for the agent that has the same name as your mailbox, and restart it. There is a search bar in KMail, which works really well for most searches (even of mail contents), so it mostly satisfies the needs. The advanced search tool can be used for a really fine grained search (more than one criteria) or to search within attachments. New messages (messages you received after starting Nepomuk email indexing) will be added directly to the index (also if they are still unread). Old messages (you had before starting indexing) are not in the index until you have actively read them (clicked on them, in POP), or if you download all the mails with content (disconnected IMAP mode of KMail). You have to wait until all the mails of a newly added mailbox are downloaded, and then wait until the indexing is finished. After clicking on them, it takes some time until they are in the index. The search has to be refreshed. It worked best by clicking on “Search in all folders” and then on “Search only in” again. Suddenly, the mails were in the index. Indexing only runs when the power adapter is connected. Reading mails with a laptop on battery will not them to the index instantly. I you liked this article, feel free to leave comments, suggestions, etc. and share. The unawareness of the positive aspects of Nepomuk is one of its biggest problems. KDE shipped version 4.8.1, containing performance improvements and bugfixes for Nepomuk and applications using Nepomuk. So everyone who experienced problems should give it a try. 1) What is Nepomuk and Nepomuk-KDE? 1.1) Why should someone use Nepomuk? Usually, data on the hard disk is organised by their file names and directory structure. The common way to open a file is to change into its directory and open it by filename, if the filename and its directory is known. Otherwise, a filename or file content search is performed to locate the file. To look at its content, usually it has to be opened. Nepomuk uses this common ways too, but extends it with more ways to describe a file, so it is easier to locate it and to get more information than just the filename from it. – Think that organising your files only with subdirectories and filenames is not informative and efficient enough. – Have large collections of pictures and/or music and you want to perform searches among them. – Have large collections of pictures and/or music and you want to get information of the files without opening it (i.e. who is on a picture, which one was good etc.). – Keep different versions of the same file or folder on your hard drive and you want to have information available which specifies them. – Work with more files distributed in different folders over your hard drive and you don’t want to have so many file manager tabs opened. – Want to perform indexed searches for file contents over all files on your hard drive. – Want to store more information to files you downloaded. – Have large documents or papers where you want to rate them and remember the important parts. Nepomuk stands for“Networked Environment for Personal, Ontology-based Management of Unified Knowledge” and is the specification of a semantic desktop. KDE implemented it in Nepomuk-KDE. Semantic Desktop…to me it sounded more like something that I want to keep as far away aspossible from my desktop. But I gave it a try, and really, it’s not that bad. Although there is no strict specification what a semantic desktop should be like, there is one main feature: Assigning meta-data to any kind of file. You probably know this from the ID3-tags of mp3 files, where information like artist, album, year and some tags can be stored independently of the filename. Now imagine to be able to do this to any kind of file, be it a text-file, video-file, or whatever. And to be able to search for them afterwards using the meta-data and content. Unlike mp3-files, the meta-data is not stored in a file itself, but in a central database in KDE. In order to be able to view it on another computer, you have to transfer it. Nepomuk is the framework itself, that provides the functionality implemented in several programs, like rating your files etc. Requests are passed to soprano, which is a library for reading and writing RDF data (resource description framework, designed by the W3C for storing metadata of files, exactly what we need here). The data itself is stored in a virtuoso database. And how do we get the data? This is Strigi’s task, a file indexer that scans for metadata in the filesystem. The semantic desktop inKDE 4.7 works basically out of the box, there are only a few clicks to do. First of all, you have to install all the required elements that are needed with the package manager. 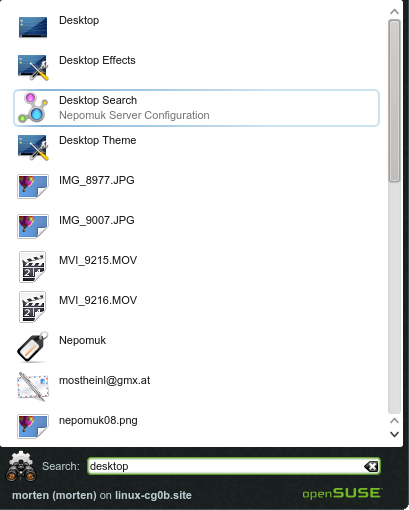 The next step is to activate the nepomuk-services and make KDE applications nepomuk-”aware”. Go into the Service Manager (simply enter “service manager” in the KDE menu search bar) and make sure the startup-service “Nepomuk Search Module” is up and running. 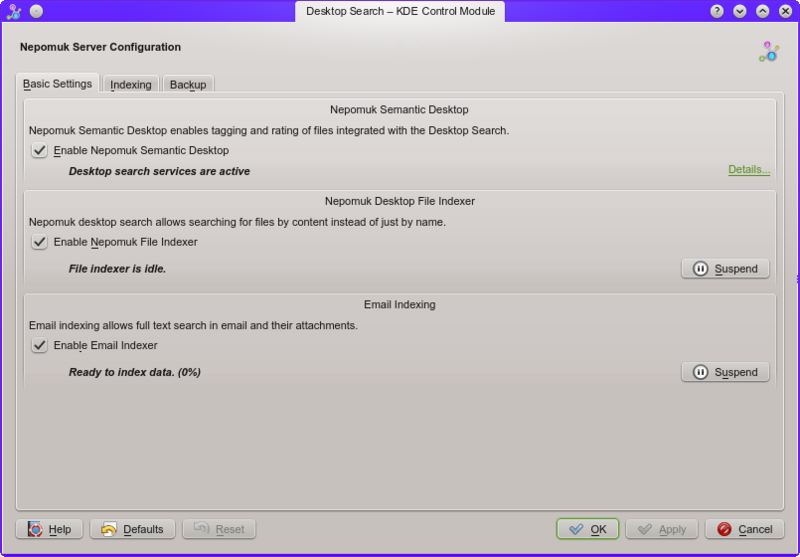 Next, open the desktop search configuration (enter “desktop search” in the KDE menu search bar). Make sure that the options “Enable Nepomuk Semantic Desktop” and “Enable Strigi Desktop File Indexer” are checked. Now go into the tab “Desktop Query”. Here you can customise the files and folders that you want Strigi to index. The option “Customize index folder…” opens the selection dialog. The exclude filters are good as they are, but in the “Strigi Index Folders” you have to choose yourself which files should be in your index. This depends on which files you want to find quickly using tags and keywords. It’s recommended for folders inside your home directory, for example pictures, music, cumulated download folders (because of the little informative file names), educational scripts (you can view what it is about without opening it), and everything where the natural structure through the file system comes to its limits. It’s not recommended for all the other system folders (bin, boot, dev,…) programming (too much text and therefore long indexing times), their version management systems (like SVN), ebook-folders (too much text too). Because of the fact that the indexing database grows quickly, you really should only index your personal files and collections, where you are in need of better structure. For finding system files or grabbing their content, it’s better (and much faster) to use the traditional locate-tool on the command line and non-indexed search tools like find, grep or the KDE find utility Kfind. So now that Nepomuk is set up, it will start the initial file indexing (if it doesn’t, try a reboot). It’s indicated with the Nepomuk file indexing icon in the task bar. Right-clicking this icon lets you choose the options mentioned before. Depending on how many files are in your chosen directories, the initial indexing can take a while. It only takes this long at the first time, but this reveals a big disadvantage of the Nepomuk semantic desktop: A fast index checking has to be performed at every startup of KDE, even if there were no modifications, because it is not possible to determine whether there was a modification between the two restarts or not. So Strigi has to scan the whole filesystem at every startup, which takes about 20 minutes and has low CPU priority, so it shouldn’t affect your work too much, and you can suspend it at any time (by right-clicking on the file indexing iconand choosing “Suspend File Indexing”). Now Nepomuk is set up and ready to use, so let’s assign some meta-data. 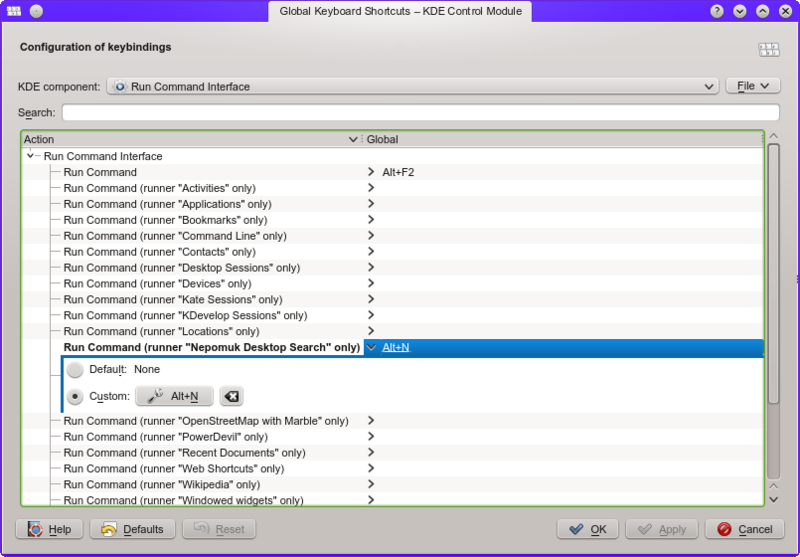 There are some documentations on the internet that state that search queries can be executed using the search field in Dolphin, but in KDE 4.7 the search bar in Dolphin doesn’t exist any more. Instead, there are two buttons in Dolphin that are important for Nepomuk: Search and Find. The Find-button opens the search bar for indexed file and content search, the Search-button shows the sidebar where you can search for filetypes, change dates, ratings and tags. The indexed search and the metadata-search can even be combined. If you don’t see the Search and Find buttons, you can add them using “configure toolbars”, either right-click somewhere in the free space right beside the buttons, or show the Dolphin-Menu with Ctrl+M and click on settings-> configure toolbars. The indexed search can be used even without having assigned metadata to a file, like rating or tagging. Simply enter a search term into the search bar and choose if only file names or the whole file content should match, and if you want to search only in the current directory or everywhere. Note that as soon as you enter the first character in the search bar, the indexed search begins and lists every file matching the search criteria. This list is updated continuously while you write, so emptying the search bar by deleting all characters lists the whole file index – this cantake a while. – The asterisk “*” is the wildcard, you only need it for for parts inside a word. (i.e. “th*y” matches “theory”). At the end and the beginning of a search term there is always a wildcard. – The index is built on keywords, this means the blank is the natural separator. In order to search for a whole word, you just need to enter it, without any wildcards. – To search for a middle part, just enter the middle part, the wildcards are added automatically. – Matches of the search query in the absolute path of the files as well as in the tags are also listed. Virtuoso 6.1.3 suffered from a unicode bug. The Unicode bug caused wrong indexing of special characters (ä, ö, ü, å, é,…) so that they appeared in search queries even if they didn’t match. You can test if you have wrong index files: Go to the filename-search, and enter a short search term with two wildcards (i.e. *eor*). If wrong results appear, and they have special characters in them, it’s due to the unicode-bug. Any other information displayed can be used for a search query, as it will be mentioned later. To add a comment, click on the blue “Add Comment…”-text to open the comment editor window. Now write your comment into the editor and hit “OK” or Alt+o. Clicking on the blue text“Add Tags…” lets you choose existing tags (if there are any) or creating new tags. Some KDE Applications (like DigiKam) add tags themselves. You can create a new tag by simply writing its name in the text field. If the tag already exists,the old tag is used (so be careful with the writing to not have 2 tags in different spelling that were meant to be the same). Hitting OK saves the tags. NOTE: Special characters, like ö, ü, ä, é, å,… weren’t displayed correctly in the add tags field and, even worse, couldn’t be deleted any more. So it’s best not to use them. Open the add-tags window again and move the mouse to the right side of the white area besides the tag name. A red “X” appears to delete the tag. The information entered in comments and tags is also used in the indexed search. BUG: To select more files and assign metadata to them all at once, you have to be carefully because of a bug in Dolphin. If you select more files (using Shift, Strg or the mouse), the information in the information panel on the right-hand side is not updated instantly, but with a delay of some seconds, especially in folders with many files, where all are selected with Strg+A. Editing the metadata too early causes a certain crash of Dolphin (but fortunately nothing worse happens). So you have to wait until the long list of metadata (which is usually shown when one file is selected) disappears and only the selection of comments, rating and tags appears, then it is safe to edit them. To search the Nepomuk-database using the entered comments, ratings and tags you can use the information panel (to search for files with the same values, i.e. the creating date, just click on the value in the information panel, and all files with the same value are listed) or the search panel (F12 or clicking on Search-button). You can search for document types, modification dates, rating, and you can see your own tags at the bottom of the panel. Simply clicking on an option invokes a search over the whole database for this value. Clicking on “more” opens the tag window, where you can search in your list of tags. To combine indexed text search and metadata-search, click first on Find to invoke a query for a text, and then choose the options you want from the search panel. 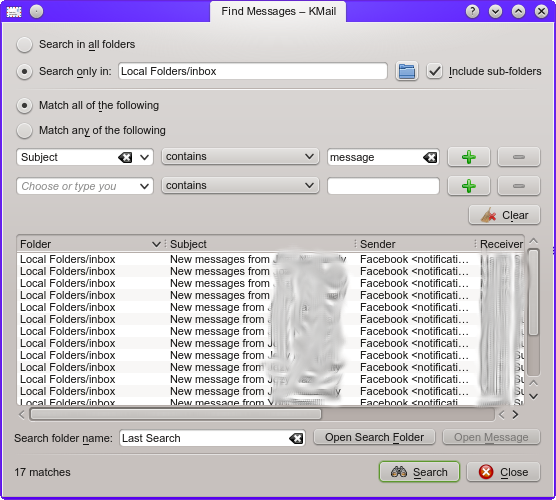 Normally, files are grouped in folders by location, that means, the folder view shows all the files that are located in this folder. 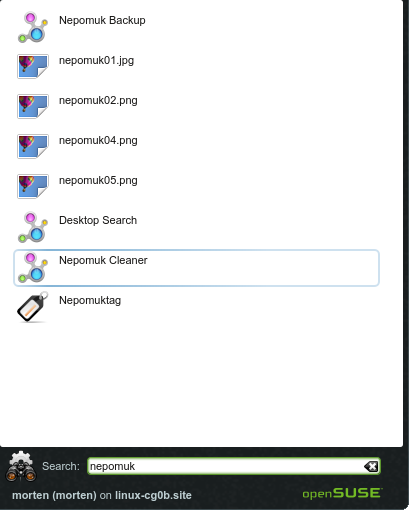 The Nepomuk virtual folders groups files by search criteria, which means all the files matching certain search criteria are displayed in the virtual folder, independently of their real location on the hard disk. This can be useful if you need a couple of files from different folders frequently. Then there is no need to switch folders or copy files to another location all the time, because all of the files are shown in one virtual folder. In order to create a virtual folder, perform an arbitrary search query, and make sure you have your places-panel displayed (F9). Then right-click in some free space in the file area and choose “Add toPlaces…”. Label your new entry and and leave the location as it is. If you want to use that folder in other applications besides Dolphin, uncheck “Onlyshow when using this application (Dolphin)”. Then click OK. Your virtual folder is now in your places panel, a click on it performs a Nepomuk search and displays the results. That means, if new files are coming to match the search criteria in the future, they will be displayed automatically alongside the others. It a file loses the search criteria, it will disappear. Clicking on “testfolder” lists all files with the tag “Birthday” in the file view as if it were a normal folder. 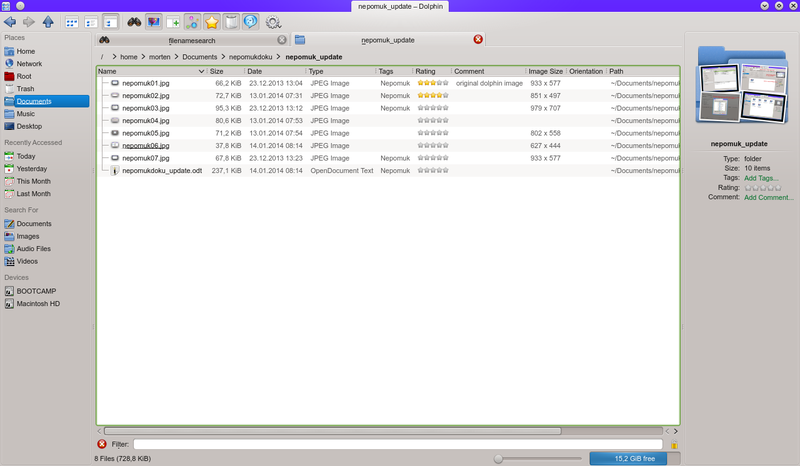 Unlike Dolphin, digiKam can use a separate database for storing its metadata. The use of Nepomuk has to be activated manually in “Settings → Configure digiKam” and then in “Metadata →Nepomuk”. Make sure the options “Store metadata from digiKam in Nepomuk” and “Read metadata from Nepomuk” are activated. If you have already set some metadata in digiKam that you want to synchronise with Nepomuk, click on “Fully Resynchronize again”. 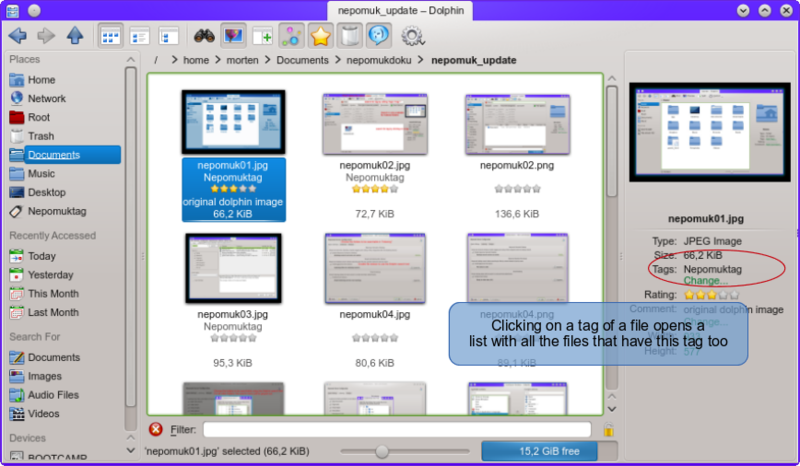 DigiKam is able to store lots of metadata for every picture, but not all of it is synchronised with Nepomuk, and only tags and ratings appear in other applications (like Dolphin). In order to manually tag a picture in digiKam, select it and click on “Caption/Tags” in the menu on the right hand side of digiKam. Now the tag editor opens. It lets you assign tags to a picture by writing them into the title field (separated by commas). To create hierarchical tags, use the slash “/”. 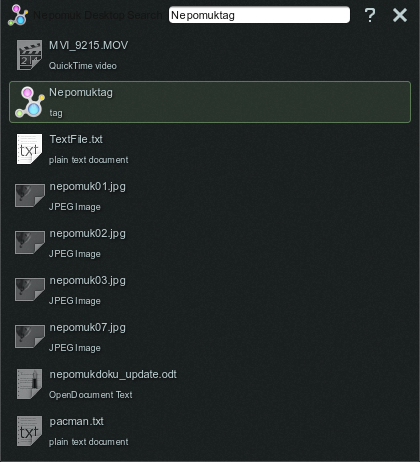 Hierarchical tags appear as a folder structure in digiKam to let you find them easier and avoid long lists of tags, in other applications they appear as single tags. For example, a tag tree with “Schweden” as a main tag and “Stockholm” and “Paintball” as sub-tags will appear as 3 different tags in Dolphin. In the tag editor you can also assign shortcuts to tags, so different tags can be assigned to selected pictures via different shortcuts. Tags that already exist or that are already assigned will be left unchanged, all the others are assigned or created and assigned. To browse your tagged pictures, click on “Tags” in the side menu at the left-hand side of digiKam. By clicking on a tag, all the pictures with this tag are shown, grouped by albums. Note that only pictures of digiKam-albums are shown, and not of the whole disk. To rate a picture in digiKam, just hover the mouse pointer over it and chose an amount of stars, or click on it and select the rating in the “Description”-Tab of the “Caption/Tags” menu on the right-hand side of digiKam. But the recognition of pictures with faces on it works very well and can make the organisation of large image collections much easier. To start the face detection, click on “People” in the menu on the left-hand side of digiKam. At the first time, there is no tags but only the button “Scan collection for faces”. The chosen photos are scanned for the appearance of faces. The currently unimplemented functionality would also assign people-tags to them on the basis of other tagged photos where this face appears. Just enter the name of the person in the picture and click on the blue confirmation icon. Don’t worry if there is more than one face on the picture, every photo is shown as often as the number of faces on it, and every time one person gets tagged. For every new name, a tag is created in digiKam and Nepomuk (if synchronisation is activated). If you want to tag the pictures in their actual size, click on “ViewImage” besides “Thumbnails”, that you can tag people by hovering the mouse pointer over them and choosing/creating a tag. seems to be currently unimplemented. It would already assign the right tags on the pictures where the face is recognised, and tag the rest with“unknown”. At the moment, all are “unknown”. In Gwenview, it is also possible to change ratings, tags and comments of pictures. Jus tmake sure the sidebar is visible (F11). Then select one picture, and click on the “Information” tab in the sidebar. Here you can change the ratings, tags and comments. The Krunner application (Alt+F2) has Nepomuk-integration, too. Activate it with “Nepomuk Desktop Search Runner” in the settings to perform Nepomuk searches via entering keywords. In my opinion, it is much less comfortable than searching via Dolphin, and needs much scrolling in case of long lists.